My website just got a makeover! Look at my pretty new webs ite! Thank you, Jax, of Jaxadora Design. You’re the best! I love every page on this site, especially my Peace, Love, Bunco! page. Check out all the cool little drop downs. I wanted a new tab to highlight recipes featured in my books. This month, it’s a golden oldie. 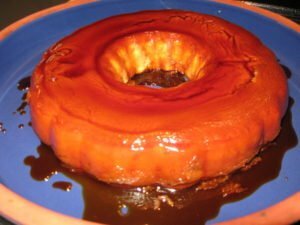 Abuela’s flan from The Boyfriend of the Month Club. If you haven’t tried it, then you’re in for a treat! Check out the recipe right here. I’m off to Melbourne to visit my folks and attend this month’s STAR meeting (Space Coast Area Authors of Romance). Hugh Howey is the guest speaker and I’m excited to hear him speak about current trends in publishing. Next → Next post: Come Join My Street Team!